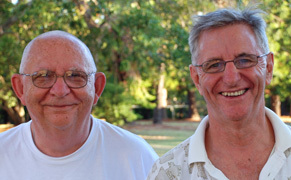 In a simple ceremony on Jan 29 at Holy Name of Mary church, Hunters Hill, NSW, Frs Bob Barber and Peter McMurrich were commissioned to serve as provincial and vicar-provincial of the Australian Province of Marist Fathers for the next three years. 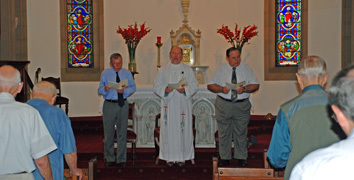 In commissioning his successor, retiring provincial, Fr Paul Cooney, presented Fr Bob with a copy of the Society of Mary's Constitutions and the Statutes of the Australian Province and prayed '..grant him your gifts in abundance, of wisdom and insight, compassions, understanding and love... and help him live the Spirit of Mary in gentleness and mercy'. The ceremony was followed by a celebratory dinner at Villa Maria monastery. Members of the Marist Fathers' Australian Province are again saddened by the death of a confrere this week with the passing of Fr John Burns SM on Jan 29 at Royal North Shore Hospital, Sydney, after a short illness. 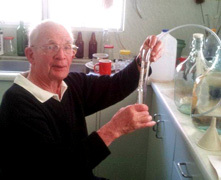 Born in rural Lismore, NSW, in Feb 1929, John came a family of five sisters and three brothers, his farming background giving him qualities of being a hard toiler, practical, and a inventive builder and maker of things. After his secondary education at Woodlawn College, Lismore, John entered the Marists in 1947 and was professed Feb 02, 1948, after novitiate at Armidale. Following seminary studies at Toongabbie, he was ordained at St Patrick’s, Church Hill, in 1954. His first appointment was to Ashgrove, Qld, for university studies at Queensland Univeristy. In 1956 Fr John went to Woodlawn College for three years before having three years at St Paul’s College, Traralgon, then transferring in 1962 to Marist College, Burnie, where he was to spend ten years. It is from these days that John’s trade mark became established – the big 500cc BMW ex police bike. 1984 saw John working in Fiji then in parish ministry in Gladstone, Burnie, West Sunshine and the Lismore diocese, and finally, for the past ten years as administrator to a parish in Rockhampton, Qld. May he rest in peace. Mass of Christian Burial will be celebrated at Holy Name of Mary church, Hunters Hill, NSW, on Mon, Feb 04, at 1.30 pm, before internment at Macquarie Park lawn cemetery. Members of the Australian Province of Marist Fathers and the McCabe family are saddened by the sudden death of Fr Patrick McCabe SM on Jan 27, the eve of his 85th birthday. 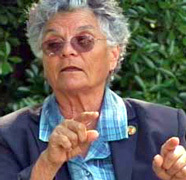 Born of Irish migrant stock, Pat attended St Joseph’s College, Hunters Hill, NSW, then worked in the family hotel industry before becoming a truck driver and woodsman. In 1955 he entered the Marist novitiate in Armidale, NSW, then pursued seminary studies at St Peter Chanel's scholasticate, Toongabbie, before ordination in 1961. 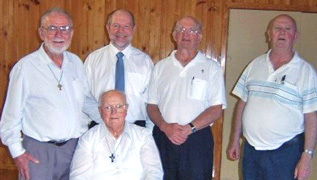 Fr Pat was appointed to the Marist parish then college at Burnie, Tasmania, and in 1968 became assistant at Claremont, Hobart, where his younger brother, Vin, was his parish priest. Then followed more parish work, this time in West Sunshine, Vic, including six years as parish priest. 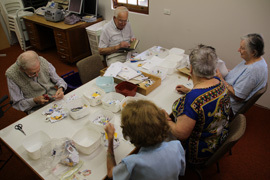 In 1981 Fr Pat enjoyed sabbatical studies in Israel, with further renewal in Ireland and Brazil, returning to Australia to resume parish ministry in Brisbane, Hobart, Darwin and Sydney. 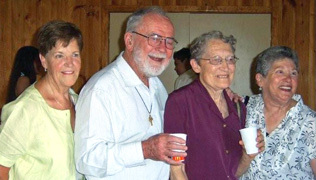 Through his years of ministry Fr Pat’s special interests included the RCIA, Beginning Experience and Antioch. His characteristic smile and laughter will be missed by Marists, the McCabe clan and Fr Pat's many other friends throughout Australia. May he rest in peace. Mass of Christian Burial will be celebrated at Holy Name of Mary church, Hunters Hill, NSW, on Wed, Feb 06, at 11.00 am, before internment at Macquarie Park lawn cemetery. From left, newly-professed Marists, Julian Tenevi, Daniel Pambaru, Julius Nalei and Ephrem Anifaegia with Fr Boniface Kevon SM / the four novices on the eve of their profession: Ephrem, Julian, Daniel and Julius. The religious profession of four young men of the Marist Province of Oceania took place at the Tutu Novitiate, Taveuni, Fiji, Jan 26.
being made there in 1972. We congratulate the new Marists: Julian Tenevi, Daniel Pambaru, Julius Nalei (all from Bougainville), Ephrem Anifaegia (Solomon Is) and their proud novince master, Fr Boniface Kevon and his staff. From the Marist Mission Districts of Brazil and the Philippines two Marists have arrived in Australia as part of their sabbatical experience. Pictured, left, in the grounds of Villa Maria monastery, Hunters Hill, NSW, are San Francisco-born Fr Al Puccinelli and Kiwi Fr Gavin Foster. 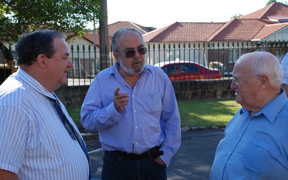 Fr Al concludes 19 years in Brazil to join the US province's formation community in Boston, while Fr Gavin, also 19 years in missionary work, will spend 2013 in M.Th.Hons studies at Sydney's United Theological College, specialising in Clinical Pastoral Eduction. He is currently CPE supervisor for the Archdiocese of Davao in the southern Philippines. The four General Councils in front of the reliquary containing the remains of St Marcellin Champagnat at the Hermitage. The combined Marist leaders shared information, prayers and vision as members of Mary's family. The General Councils of the Marist Family: Marist Sisters, Missionary Sisters of the Society of Mary, Marist Brothers and Marist Fathers, gathered at the Hermitage, Mother House of the Marist Brothers, at St Chamond, France, from Jan 17 to 21, for their annual meeting. The group also visited La Valla, the small town where the young Fr Marcellin Champagnat was first appointed and the site of the original Marist Brothers' school, founded in 1817. On Jan 20 Fr John Hannan SM, superior-general of the Marist Fathers, presided a Mass in the shrine of Our Lady of Fourvière, Lyon, where the first group of Marists pledged to found the Society of Mary. 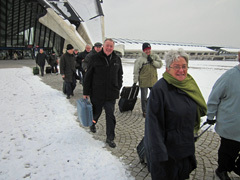 Above: Marist leaders at Lyon airport / The Hermitage under winter snow. Sessions at the Hermitage. 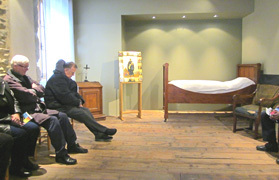 Below: Fr John Hannan and fellow Marists at prayer in the bedroom of Marcellin Champagnat. Piecing together the Marist family vision. Marist Mission Centre and provincial office staff, friends and fellow-volunteers gathered on Jan 22 to celebrate the 80th birthday and outstanding service of volunteer and lay Marist, John Burton. 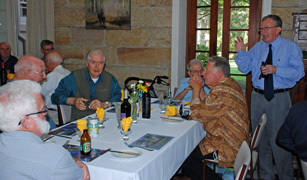 In toasting John, MMC director, Fr Kevin Stewart SM, recalled how John and his late wife, Valerie, began their association with MMC in 1971, with the then-director, Fr Michael O'Halloran, supporting four subsequent directors at the Hunters Hill, NSW, centre. Above: John Burton toasted at MMC / ... with his 80th birthday cake. 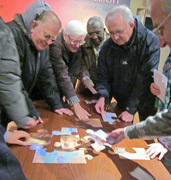 Below: John and fellow volunteers at their Tuesday work session at MMC / volunteers now include retired Japan missioner, Fr John Hill SM. Fr Kevin Stewart preparing the champagne toast. 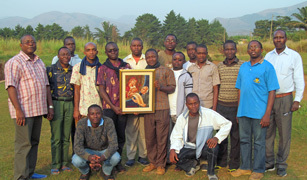 Fr Albert Kabala SM reports from the Marist Mission District of Africa: 'Our last Marist Vocation Group in Bambili was held for four days just after Christmas. The theme was about those Marists who stand as models of Faith: Fr Colin, Fr Champagnat, Peter Chanel and the Marist mission itself as a school of faith, specially the work of education. At the 'Colin Corner' of St Patrick's, Church Hill, Sydney, the 'Fr Colin Leaflet' is regularly available in English as well as a 'language of the month'. For January the language is Arabic, catering for the significant number of Arabic-speaking Catholics in the Sydney area. Previous languages have included Tagalog, Vietnamese, Croatian, Spanish, Maltese, Korean and Italian. Upon his designation by the Superior General, Fr Bernard Thomasset SM has been appointed as Vice-Postulator of the Beatification Cause of Marist Founder, Jean-Claude Colin, by the Postulator General, Fr Carlo Maria Schianchi. Fr Bernard is a member of the French region of the Marist European Province and his task will be to represent the Postulator General before the curia of the archdiocese of Lyons and other curias in France during the preliminary stages of the beatification process. 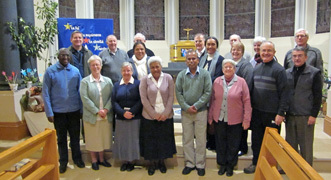 The 21st Provincial Chapter of the Oceania Marist Province began in Suva, Fiji, on Jan 06, to conclude on Jan 18. Two Australians are part of the gathering: OMP provincial, Fr Ben McKenna, and observer for the Australian Province, Fr Gerry Hall. Back row: Falani Terry, Chris Martin [NZ], Milikiade Rayalu, Michel Tuvini, Soane 'Ahohako, Benedict Manacen, Patolo Matiasi, John Crispin, Pio F Waqavotuwale [Sec], Elia Sawesawe. Middle row: Gerard Hall [Aus], Emiliano Lasaqa, Setefano Mataele, Petelo Sekeme, Soane M Pulotu, Lutoviko Manu [Moderator], Leronio Vodivodi, Robert Taria, Francois Grossin. Front row: Michael O'Connor [President], Jacob Aba, Milio Vakasirovoka, Ben McKenna [provincial], Stephen Posirou, Lote Raiwalui, Susitino Sionepoe [Convenor], Brian Sigere. 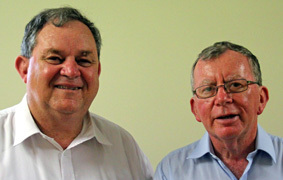 Fr Bob Barber (provincial) and Fr Peter McMurrich (vicar-provincial) have begun three-year terms as key leaders of the Australian Province of Marist Fathers. Both are experienced in leadership roles and have each spent terms as vicar-provincial in recent years. Fr Bob's pastoral background includes secondary education and parish ministry as well as missionary years in Africa. 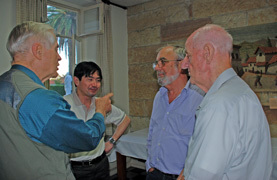 Fr Peter, after some time in secondary education, has worked in Marist parishes in Australia and is the province's archivist and author of a number of works on Marist history in Australia. We wish them well in their important ministry. With the encouragement of Marist Fathers Superior-General, Fr John Hannan SM, Marists across the globe are invited to reflect on the words of their Founder, Jean-Claude Colin, each week of the present year. 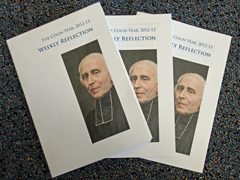 Suitable for Marist Laity as well as priests and religious, weekly quotes and reflection guidelines in several languages are available from the Colin website . 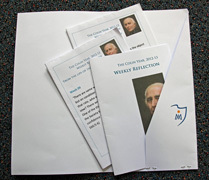 A simple folder to contain reflection material (pictured) is the latest resource to be added to the website, downloadable from the 'Colin Year' pages. A handy list of weekly dates is included on the folder. Pope Benedict XVI's theme of 'Blessed are the peacemakers'. Full text at JPIC. The Marist Mission District of the Philippines has launched its new website www.maristasia.org. The site includes pictorial glimpses of the District's involvement in Thailand as well as the Philippines. Also featured is the newly-named formation community residence honouring pioneer Australian missionary in the Philippines, the late Fr Philip Callaghan SM. 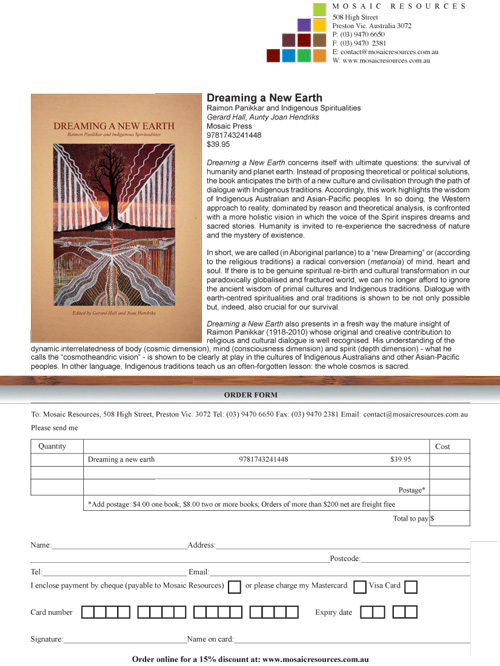 Indigenous leader, Aunty Joan Hendriks, and Marist Theologian, Fr Gerard Hall SM, have combined to consider the ultimate questions of survival of humanity and planet earth in their recently-launched book, 'Dreaming a New Earth'. The book is inspired by the late Raimon Panikkar and his insights into indigenous spiritualities. Download an order form here. For our devoted statistics lovers: 100,000 (well, not quite... 99,181) visits to the Australian Marist province website resulted in over three million 'hits' in 2012. 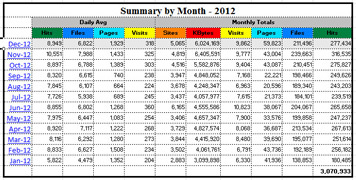 This compares with 74,000 visits and 2,150,000 hits in 2011. In December visits came from over 80 countries; top ten (after Australia) being New Zealand, Italy, Japan, Ukraine, Thailand, Brazil, Germany, Wallis & Futuna, Canada and Luxembourg.